This 5-star luxury resort is located on a white sand beach in the Dubai Marina. It features a large outdoor pool with sun-lounger terrace, a fitness centre and a spa. 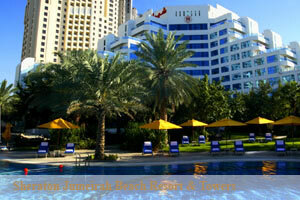 Every room at the Sheraton Jumeirah Beach Resort & Towers is equipped with satellite TV, and a kitchenette. Some rooms offer scenic views of the Persian Gulf. Guests can relax with a massage and in the sauna at Sheration Jumeirah’s spa. The hotel also offers a 24-hour front desk service. At the Palm Garden All Day Restaurant guests can enjoy international cuisine. Australian steaks and fresh seafood are available at The Grill Room Restaurant. The Sheraton Jumeirah is 2 km from the Emirates Golf Club. The Walk at JBR is only steps away. Free on-site private parking is available. Take Sheikh Zayed Road toward Abu Dhabi. Exit at the 5th Interchange towards Internet and Dubai Media City. Turn left at the traffic lights facing the Hotel Mina Seyahi. Follow the directions to the hotel.